The Botanic Cottage originally stood at the entrance to a long lost incarnation of the Botanics, across the city on Leith Walk. It was built in 1764-5, and designed by the renowned architects John Adam and James Craig. Not only was it the home of the principal gardener, it was also the main entrance to the Garden, and contained a classroom where every medical student was taught botany during the height of the Scottish Enlightenment. After the Garden moved to Inverleith in the early 1820s, the cottage became a private home, then later offices and a van rental shop. Over the years the street level was raised in front of it, the lime render on its exterior was lost, and by the mid-2000s it had been abandoned and set on fire. Fortunately, a community campaign, working with the Botanics, saved the cottage. It was moved stone by stone across Edinburgh, and rebuilt in our Demonstration Garden, where schools, students and community groups have plots. It was rebuilt with all of the stones and timbers going back in the correct places, and finished so that it looks as good as it did 250 years ago. 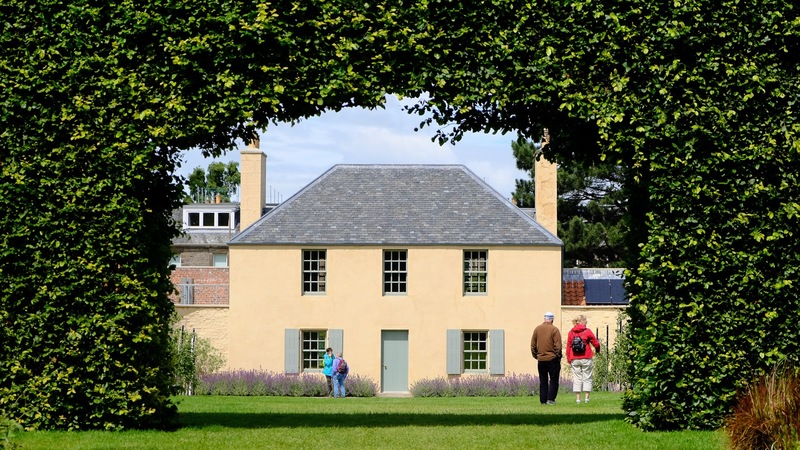 The Botanic Cottage now hosts a wide variety of education and community sessions, as well as public events, throughout the year. The cottage is primarily used for pre-booked groups, but on selected dates each month we put on events which can be enjoyed by the wider public – check our ‘What’s On’ listings for details.